How much can be achieved in a single lesson? 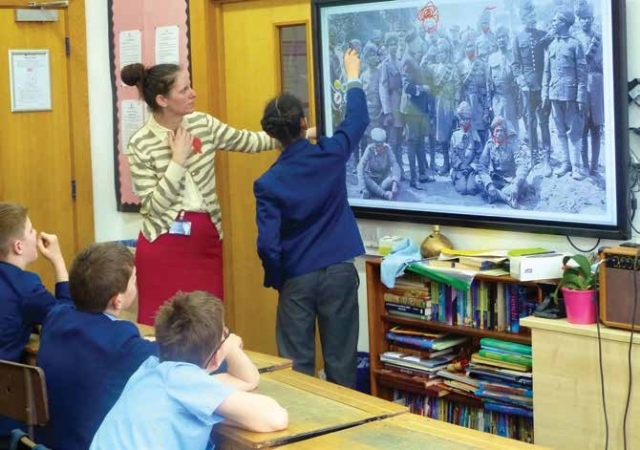 The objective of this lesson plan was to enable pupils to develop a greater understanding and appreciation of the input of Muslim soldiers in World War I and to do so through empathy and creative discussion. I very much enjoyed teaching this session with a group of Year 6s, all of whom had been studying World War I in their history lessons yet who all left the classroom buzzing with interest and new learning. I intended the lesson to build upon their prior learning yet not to be reliant upon it, so other teachers could follow the plan and use their pupils’ general knowledge of World War I. This article from Primary History 79 is accompanied by an additional lesson plan document and powerpoint presentation which can be downloaded below. Elizabethan times: Just banquets and fun? Scheme of Work: The Blitz: all we need to know about World War II?